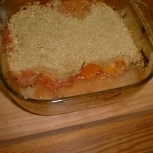 Place the rhubarb in a dish, and add the other fruit, cut into pieces. I find tinned pears work well, or you can use real fruit, anything at all. Microwave until warm and cut the fruit up some more. Grate at least one inch of fresh ginger into the fruit mixture, add the zest and juice of an orange, and stir well. Microwave again until soft and well mixed. Add a spoonful of sugar to taste if required. In a food processor mix the crumble ingredients. I mix them 2:1 oats to butter, then add flour (up to a half as much as you added oats) and sugar (again up to a half as much as the oats, then taste and add more if necessary). If the mix is too dry for your liking, add more butter. As you add each ingredient pulse the food processor and taste the crumble to see how you like it! Squash the fruit down so it is even and there are no lumps, protrusions or wet patches. Add as much crumble as you wish (I prefer a thin layer), sprinkle with sugar and bake in a medium-high heat for 15 minutes. Delicious - the ginger adds an adult feel to a traditional pudding! Nutritional Information: If you follow my amounts above, this will give six servings each of 200 calories and 6g fat.